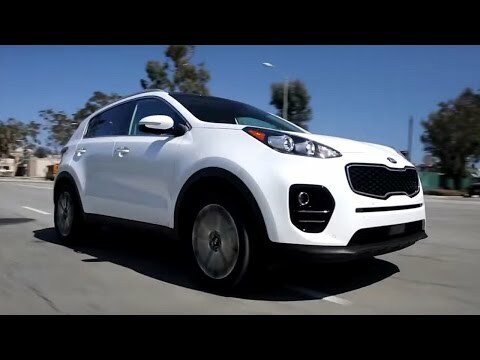 The 2016 Kia Sportage isn't your average compact SUV. It packs a big dose of style and substance, not to mention an available turbocharged engine, all for about the same price as its competitors. Unfortunately, the Sportage doesn't excel in the areas of storage space or fuel economy, two attributes most compact-SUV owners seek out first. Will trade this Kia Sportage for another one when I get ready for another new car! My Kia Sportage is 100% reliable. Thank Heaven it's been completely dependable. So far over the past years we've not had any minor or major trouble with it. I had for years driven 2 and 4 door sedans and hatchbacks. My first complaint about them that I they sit to low on the streets and have always worried about them stalling out during heavy rain and flooding streets in water. The very first thing I love about my Sportage is how it sits fairly high above ground. It's not as high as a pickup truck or SUV. But it does sit higher up than the sedans and small hatchback cars. And another thing I love is , it's easier to see around and or higher up above other cars to see the oncoming traffic. It does also get much better gas mileage than pickups and SUVS. Even though it's only a .6 or .4 cylinder engine it has the get up and go when passing other cars and driving from feeder roads into hwy of faster speeds. When I get ready to buy a new car it certainly will be another Kia. Kia Sportage - great SUV to own. Great gas mileage. Comfortable seats and easy to keep clean. Bluetooth feature is bonus. Good sound system. Great pickup and acceleration. Very sporty and sleek design. Does not have the backup camera but really not necessary. Very affordable and Kia offers great customer service. Have had no problems with engine or any interior features. Roomy and comfortable on long trips. Plenty of room in trunk area for luggage or everyday shopping. Rear seats fold down to allow for more space to transport large items. Overall a great SUV to won. Would definitely purchase again. Love my vehicle but suddenly the sportage started not getting into gear. Engine light came on so took it to the deal. First story was my oil was very low and radiator was too full. Flushed out both and then I got a call that my transmission was out and needed to be replace. This is a 2016 Kia Sportage with 30,000 miles and transmission is out. Because it was under warranty the transmission was replaced but not I only have a 12 month or 12,000 miles warranty.